Some items in order to recoup some money back after use, hold other complications, where there is an emotional factor in addition to safety issues. I had never had cause to think about this until the death of a friend, but clearly an unwanted stair lift is a product which can present problems. By definition, aids designed to transport a person up and down stairs are sadly often required short term. Generally, a stair lift will be purchased for a person experiencing mobility problems in their latter years. When the day comes that the lift is no longer required this can be a real headache. If a house is to be sold, a younger buyer will almost certainly want the lift taken out. 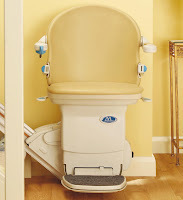 If relatives are staying in the house, it is very understandable that they do not want to look at a still and empty stair lift as a painful reminder of the loss of a loved one. 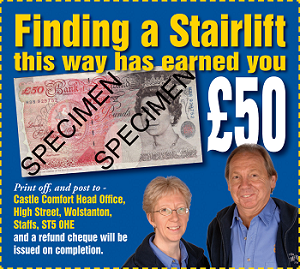 The brief points below are taken from an excellent article on the subject of stair lift removal and selling second-hand – well worth taking a look. 1)A stair lift is a costly item to buy, but, when wanting to sell, as with most items, one has to be realistic about the second hand value. 2)There is help on hand and a trip to the local council tip is not the first option. 3)A straight and modern stair lift, manufactured in the past three or four years, can often be removed, checked over, serviced, and having had new batteries, be fitted on a different stair-well. 4)It is essential that the ‘hand’ is the same – that means right or left side of the stairs and that the track length is the same. Curved stair lifts usually present problems as they are a bespoke installation for a particular property. It may be that the only value is in the carriage which may be suitable for use in a new installation using tracks of the same make. Whist researching the subject, I came across this very tragic story. We live in an age of materialism. Our homes are full of white goods, electrical goods, technology, computers, tablets, smart phones with ‘apps’ and of course, clothing and food. All are ‘must have’ part of daily life. For some, shopping or ‘consumer therapy’, is a pleasure and even an addiction. I am always staggered to see the number of people camping out overnight outside the large department stores waiting to take part in the buying frenzy of the post Christmas sales in something akin to a stampede or rugby scrum! For others, shopping is an unwelcomed necessity which they at best tolerate and even choose to avoid wherever possible. For a long time, consumer law has been based on Caveat emptor – let the buyer beware. This is really a property law principle that controls the sale of real property after the date of closing. The buyer could not recover damages from the seller for defects on the property that rendered the property unfit for ordinary purposes. The only exception was ‘if the seller actively concealed defects or made material misrepresentations amounting to fraud. ‘ This principle is very relevant to selling on Ebay where ‘distance buying’ requires the seller to declare the true condition of an item, such as ‘cracked’ or ‘chipped’ or otherwise not in mint condition. Before statutory law, the buyer had no express warranty ensuring the quality of goods. In common law, goods must be “fit for purpose” and of “merchantable quality”. An oven cleaner must result in a clean oven or a tin opener must open a tin! A friend once said that Tesco had merged with MFI. She had bought a chicken but the legs fell off! Consumer Law has moved away from the ‘buyer beware’ principle with the introduction of enhanced consumer protection. Let it be said that this implied warranty can be difficult to enforce and certainly time consuming to pursue to the bitter end. In spite of improved consumer rights, entrenched in the Sale of Goods Act 1979, buyers are still advised to be cautious – Caveat emptor! In the UK, what rights do consumers have? There are several areas to consider; faulty goods, wrong size and simply unwanted. Consumers have the right to a full refund for damaged or faulty goods. In my experience, goods falling into this category are becoming more common and seem to indicate that there is little or no quality control in many areas of production, especially in China and East Europe. We have all taken home a flat pack, struggled with the often unintelligible instructions only to discover that screw ‘A4’ has been left out the pack – resulting in a Victor Meldrew expletive and a tiresome return to the store. I bought a new electric cooker and extractor hood from Comet (now closed down) – simple enough operation surely. How wrong can one be? The first issue was to discover that “Free Delivery” only applied to a two to three weeks delivery period. Next day delivery incurred a charge. Albeit not too pleased, I agreed to take that path. The first cooker failed to function properly after just one period of attempting to cook with it: the principles of “fit for purpose” and “merchantable quality” clearly implied that the cooker would be replaced. So, another trip to the store, using my time and my petrol, was on the agenda. In fairness, the assistant did not quibble and without saying it in so many words, implied that she was not surprised! A replacement cooker was ordered, but it would be a week or more to come off the stock line. At this point, I remonstrated; pointing out that my old cooker had been taken away for recycling by the crew who delivered the new one. How was I to eat? Could I eat out and send the bills to Comet? The response to my question was a laugh and the use of an expression commonly used in Stoke-on-Trent and Newcastle under Lyme; “Oh Shug, what are yer like?” I did not join in the atmosphere of helpless mirth! After a search around other stores on the computer, one identical cooker was located but delivery would still be a few days away. After an enforced period of dieting, cooker number two was delivered and installed. Guess what? After two days the same fault appeared and I was once again left without the means to cook. My second return trip to the store followed. On this occasion I insisted on a different make and at the same price, A tad reluctantly, the manager agreed. Touch wood or something, cooker number three is still working after 18 months, but don’t hold your breath. The response to my enquiry asking if they stocked the filters was that they were available as ‘optional extras’ on line – quite contrary to the book statement that they were a must for correct functioning of the appliance. Once again I insisted on a product by another manufacturer and returned home, hoping that the required screw holes would be in the same place before my kitchen wall resembled a well worn darts board. In the UK, consumers do have the right to a full refund on faulty goods. Most companies will allow customers to return goods, even if not faulty, within a specified period of time for a full refund or exchange. This sometimes excludes products sold cheaper in clearance sales. The principle of Caveat emptor may at first seem to be very one-sided. However, it is balanced more fairly by another principle, Caveat venditor or “Let the seller beware.” This forces the seller to take responsibility for the quality of the product, so don’t be fobbed off if quality is the issue. Another area of dispute is the requirement to return goods in the original box or even more unreasonable, unopened. Just how a product can be tried without taking it out of the wrapping, often nigh on impossible to open neatly, is a mystery to me. Have you noticed how the task of replacing a product in the original box and polystyrene packing is a challenge worthy of the Crypton Factor? It just will not go back in the manner in which you unpacked it. As for keeping the box in case you need to return the product, just where in a modern house are these boxes to be stored and for how long, before consigning the cardboard to the recycling bin? I find it interesting that older houses, built long before the increase in consumer goods, had the facility of a ‘box room’. All houses being designed today should include such an aptly named and much needed area. Then, of course, there is the condition requiring one to produce a receipt when returning a product. Rather like the mystery of the missing sock, resulting in a number of single items missing their partners in the sock drawer, whatever happens to those annoying strips of paper, which after a lengthy search usually manage to evade the hunter. Don’t bother. You are not required to produce a receipt if you can show proof of purchase such as an entry on a credit card statement or evidence of a payment by cheque. It is worth pointing out at this point that it needs to show the same amount as the price of the item. An accumulative figure for a number of items may well be more difficult. Do shops have to give me my money back? The answer here is no, they do not. Making a purchase is in effect entering into a legally binding contract therefore they do not have to give a refund because you have changed your mind. Only if your statutory rights have been breached (i.e. that the item is damaged, of poor quality or not fit for purpose) do they have to refund your money. I may say however, that it is perhaps bad business practise to refuse. A lady I know spent £120 on two mirrors in a local outlet only to realise that they were too big for the intended room. She returned the mirrors in good state but the shop owner refused a cash refund. All that was offered was a credit note, tying the customer in, resulting in having to buy a number of items which were not wanted or wave good bye to the cash. The action may well have been within the vendors ‘rights’ but it was certainly short-sighted. This particular lady had spent money with the shop before and would no doubt have done so in the future. Such was her dissatisfaction that she has not shopped there again. Most companies now offer a 30 days ‘guarantee period’. As part of their returns policy, both Amazon and Argos apply this rule. Most things are covered by our 30-day money-back guarantee, so just return them to us, unused, in their original undamaged packaging, in saleable condition, with your receipt and we’ll give you a refund. If you don’t have the receipt, as long as you have proof of purchase, we will exchange the item or give you a refund in vouchers. Human nature often reveals some less attractive attributes. I recall a BBC Watchdog programme that featured the rather bizarre issue of unwanted Christmas presents. However churlish, it seems that people actually do return their presents. The programme featured a list of stores which generally offered a no receipt return policy, pointing out that the exchange or gift card will be the value of the last known selling price on the system. Boots – unlimited but receipt required. Poor old Aunt Maud. So much for appreciation and Festive Spirit! An unwanted gift, or a shirt of the wrong size are both relatively easy to deal with. Other purchases come into a very different category. I have a nephew who experienced problems with a brand new top of the range Mercedes. It developed a dangerous fault causing the car engine to cut out, sometimes at speed on a motorway. After a number of repairs failed to rectify the fault the car was finally replaced as it was ‘not fit for purpose’. Finally, on a lighter note, take a lesson from the scam by a customer at the returns counter in the Stoke-on-Trent branch of Marks & Spencer. I can verify the story direct from the lady who was working on the counter at the time. A large and vocal Potteries woman, accompanied by a diminutive and timid looking man, approached the returns counter clutching an M and S carrier bag. The woman wanted to return a pair of men’s trousers, explaining that they were not the right size. She produced a receipt dated a couple of weeks earlier. The assistant, in line with the returns policy, laid the trousers out on the counter for examination. The assistant politely pointed out that the knees were bulging and that the back of the knees clearly showed crease marks indicative of the fact that the trousers had been worn for more time than just trying them on. The woman became more insistent. After quite some time of repetitive conversation along the same lines, with husband looking uncomfortable and remaining silent, and with the queue getting longer with impatient customers, the assistant called for the support of her supervisor. Having listened calmly to the woman’s request and assurances that the trousers had not been worn, she placed the cuffs of the trouser legs together and held them at head height to clearly show the bulges and creases running across the knee area. The customer’s rant was suddenly silenced as a pair of her husband’s underpants fell onto the counter. The trousers were hurriedly scooped into the carrier bag with one hand, whilst her husband received a slap to the head with the other ample palm. “Just wait ‘till I get you ‘ome!